Dating back to 1925, the historic Cleveland Hopkins International Airport (CLE) has recently enjoyed its 80th birthday and celebrated this in style. Hopkins Airport is conveniently just 16 km / 10 miles to the southwest of downtown Cleveland and is also close to Berea, Lakewood, Lake Erie, Parma Heights and Westlake. Based in northeastern Ohio, Cleveland's airport handles around 12 million passengers (30,000+ every almost single day) and sees in excess of 300 daily services, flying non-stop to approximately 80 different destinations. American Eagle and USA 3000 are amongst the most noteworthy airlines based within its terminal and its four concourses. Hopkins Airport offers travelers a number of ground transportation options, linking downtown Cleveland, the highly acclaimed Historic Warehouse District, Little Italy and its high concentration of restaurants, the many museums within the University Circle, and Ohio City, which lies over the river. Lorain County Transit (LCT) are especially popular and link the nearby Oberlin College, while Greyhound buses are also available, along with shuttle buses, airport taxis and the Red Line rapid metro rail system, operated by the Greater Cleveland Regional Transit Authority (RTA). The city of Cleveland stands in the state of Ohio, within Cuyahoga County. Cleveland's very heart is centered around Public Square, a large and important open space dominated by the enormous Terminal Tower. The majority of the city's main attractions can be found within the downtown district and also around the University Circle, being close to the Western Reserve University campus. Highlights include the Cleveland Metroparks Zoo, Great Lakes Science Center, Rockerfeller Park, Natural History Museum and Rock 'n' Roll Hall of Fame, a breathtaking contemporary museum located next to Lake Erie. 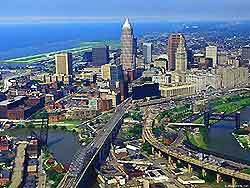 Close to the city itself and its revitalized waterfront, Hopkins Airport (CLE) is particularly near to Cleveland's suburbs of Lakewood, Fairview Park and Westlake. The city of Akron lies just a short distance to the south-east of Hopkins Airport and is known for its appealing shopping district, particularly around Quaker Square, Highland Square and the West Point Market.